The new Hot Dog Pet ID Tag in a heart shape. From the brand that knows pet accessories and personalization, Hot Dog Collars! These hot new designs and super bright, colorful, and can contain any text you'd like us to engrave. Keep your doggos safe in case they are lost or simply decide to visit the neighbors down the street. Now with LASER engraving. The laser actually affects the tag at a molecular level, changing the surface of the tag itself. That way there is no way the engraving can wear thin, rub off, or otherwise become illegible. Most customers choose to engrave the dogs name, phone # (theirs, not the dogs), and either a 2nd phone # of an address. OR you can get creative and put a funny saying, what your pup like to snack on, or anything else. We've even had marriage proposals on the tag :-o How cool (or hot) is that? 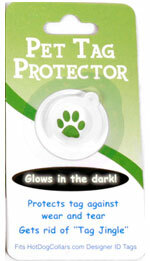 PERSONALIZED ID TAG - Put 3 lines of text on this tag to help protect your dog or cat should they ever become lost. Use your phone #, address, email, social media handle, or any other text you want. Get creative, or even ask us to write a fun saying or quote! NICKEL ALLOY MATERIAL- Sure, it sounds funny, but this material is actually more resistant to corrosion than stainless steel!. Our specially processed metal means this tag can survive all the elements. Including salt water, dirt, wind, rain, and anything else your pup can throw at it. Built to last, hold it's color, and never rust or corrode. LASER ENGRAVED - The personalization actually bonds to the tag itself so there is no way for the text to fade away, rub off, or become illegible. 100% GUARANTEED FOR LIFE - If something goes wrong, or even if the tag is lost, we will replace it no questions asked. Note we can replace tags with an identical version only. Got different colored one for each of our four pups and they look really nice - front and back. Will be back later for collars. I love the tags. They are bright and for the price definitely worth it.